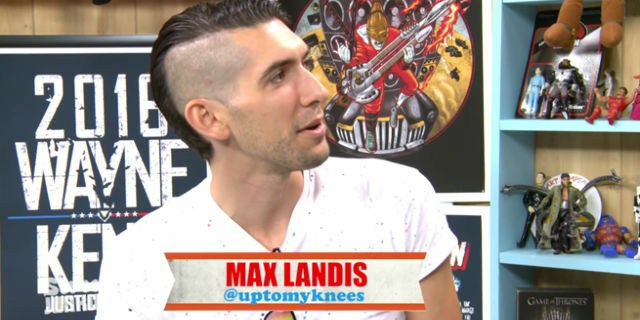 Max Landis (born August 3, 1985) is an American screenwriter, director, producer, and actor. He is best known for writing the films Chronicle (2012), American Ultra (2015), and Victor Frankenstein (2015), a film adaptation of Mary Shelley's 1818 novel Frankenstein, as well as a variety of short films including The Death and Return of Superman. He is the son of director John Landis. Ghostbusters: A paranormal researcher (Melissa McCarthy), a physicist (Kristen Wiig), a nuclear engineer (Kate McKinnon) and a subway worker (Leslie Jones) try to rid New York of ghosts that can possess humans. *If you don't want to watch the whole video skip to the 10:48 mark. That is where Landis begins to talk Ghostbusters.